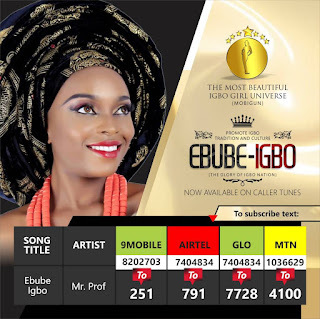 To PROMOTE the IGBO CULTURE AND TRADITION here is a brand new single from Mr Prof.
EBUBE-IGBO ( The glory of Igbo Nation) is a beautiful Igbo song dedicated to The Most Beautiful Igbo Girl Universe (MOBIGUN). It a beautiful song which promotes Igbo Culture and Tradition. Ring back tune to this song Now available in all networks. Mtn, glo, 9mobile, Airtel.